Lucy's Kitchen Notebook: Poutargue, Bottargo, Bottarga? What is poutargue, aka bottargo or bottarga? It is salt preserved roe of mullet or tuna, a Mediterranean specialty, of which variations exist in Italy, France, North African countries, Turkey, Spain and Greece. The swollen egg sacs are removed in-tact from the fish, and conditioned for long conservation in salt, pressed between wood planks. Poutargue is traditionally enveloped in wax, but also can be found shrink wrapped. 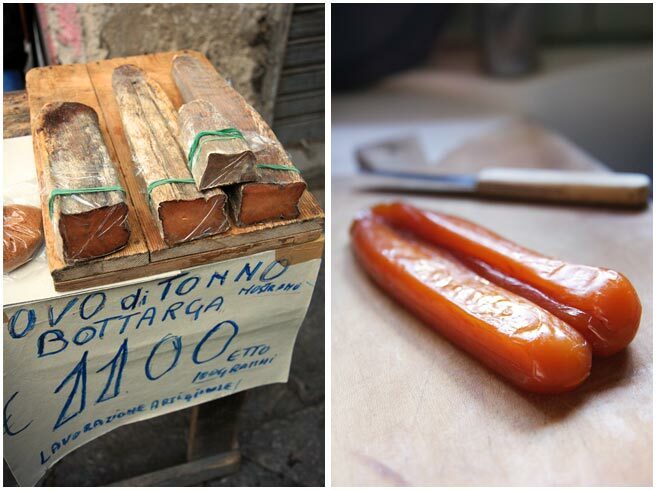 In Sicily, at the salt flats in Trapani and in the city of Palermo, tuna bottarga comes from the bluefin. It is enormous, dried hard, and sold in slices by weight. Mullet poutargue from near Marseille is such a moist delicious marvel we buy it to make our Piccata de Veau à la Poutargue. While the Italian connection is strong in our minds, a little research tells me that in France, poutargue goes way back, and because it travels well, it found its way up the Rhone to Lyon in the early 17th century. It is mentioned in Lyonnais literature (Huguetan, 1607) as a product from Provence that creates a healthy thirst called "Botarges". Its provenance is further clarified in the late 1700s, in the Dictionnaire portatif de commerce, which lists 8 Marseilles producers, in an area called "Martegue". Shaved in thin slices and sprinkled with olive oil, it is delicious on salads, the salty flavor marrying beautifully with the bitter herbs and greens like arugula, wild chicory, frisee, and endives when they are in season. The trinity of poutargue, potatoes and green olive oil is sublime. Use your poutargue little by little, in shavings, slices, crumbled, anywhere you might envision the use of anchovies as well. The flavor goes a long way, so don't worry about the expense. You can make it last. I've wanted to try bottarga ever since reading about it in one of my favorite cookbooks, the Zuni Café Cookbook by Judy Rodgers, but haven't found it around here yet. Maybe I'll just have to break down and mail order some. Lovely photos, by the way! I have tried it before, on pasta I think? It has a very musky taste, it really lingers. I feel like it should be something the Japanese would love. Maybe it is? In Greek, it's called "tarama", and the spread we know is "taramosalata". Emulsify the botarga with bread crumbs, lemon juice and olive oil. Excuse me Lucy, but what, and how do you make Piccata de Veau à la Poutargue, please? A winemaker in Greece served me a mezze with olives, whole anchovies, raw chunks of garlic, grilled rosemary sardines and paper thin slice of the pressed roe. There was nothing shy on that plate....needed lots of bread and rose wine. I think I'd like it with potatoes and green olive oil. Mmm. My imagination is in a state of gastronomic bliss! There's a great restaurant in Cincinnati called the Rookwood. They shave a little bottarga on top of devilled eggs. So savory and delicious! I have never tried this... I keep meaning to but don't get around to it... the idea of putting it on potatoes pushed me over the edge. WIll try! Ahaaa! This sheds light on "how does one eat poutargue", as I have long wondered what to do with it. Thanks for this fascinating post. I will keep an eye out for it and try this ancient savory - with new potatoes and olives, bien sûr! This sounds just delightful. Can we get it stateside?